It’s an interesting project because planning permission was already in place for a one-and-a-half storey house, but that proposal was too small for our client. So, our challenge was to design something in-keeping with the local environment and existing buildings on this beautiful wild island, but that was large enough for our client. Houses on the island are mostly single-storey and symmetrical with central doors. There are also longer shed-style dwellings, often with curved rooves, on a neighbouring island. We didn’t want to create an abnormally long building or to go higher, as these designs wouldn’t fit in with the local architecture. Our solution was to separate the living accommodation from the bedrooms and join them by a link. This creates a steading-like feel and offers a generous amount of clearly defined space. The first wing offers dramatic living areas with expansive views across the landscape. The other wing contains cosy bedroom spaces with alternative views, and the join offers a central practical hall space with a pleasing atmosphere. 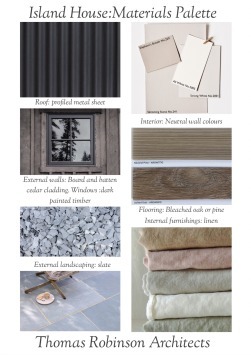 We’re all excited about this design and are raring to go to begin developing the project see our materials mood board.